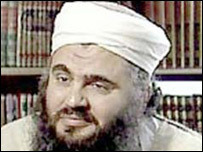 Radical Muslim cleric Abu Qatada was "a key UK figure" in al-Qaeda related terror activity, an inquiry found. The special immigrations appeals commission said in January that Qatada has lost his appeal to be freed from detention without trial in Belmarsh. Now a copy of the full appeal ruling has been obtained by Channel 4. It said there was sufficient evidence to conclude Qatada had been "concerned in the instigation of acts of international terrorism". Commission chairman Mr Justice Collins said: "We have indicated why we have formed the view that the case made against the appellant is established. "Indeed, were the standard higher than reasonable suspicion, we would have had no doubt that it was established. "The appellant was heavily involved, indeed was at the centre in the United Kingdom of terrorist activities associated with al-Qaeda. "He is a truly dangerous individual and these appeals are dismissed." According to the document, Qatada held a series of conversations with an MI5 officer in the mid-1990s in which he had suggested his willingness to co-operate with UK authorities to help prevent Islamic terrorism in Britain. At one meeting he apparently pledged to "report anyone damaging the interests of this country". On another occasion Qatada was said to have insisted those over whom he held influence were of no risk to UK national security and that he would not "bite the hand that fed him". The commission's ruling said Qatada relied heavily on "three interviews he had with a member of the security services in June and December 1996 and February 1997". The report continues: "The first of these records his passionate exposition of jihad and the spread of Islam to take over the world. "He claimed to 'wield powerful, spiritual influence over the Algerian community in London ... he maintained that a decision had been taken in Algeria not to mount operations against the UK. "The second interview ... the appellant said he did not want London to become a centre for settling Islamic scores and, in the view of the officer concerned, he 'came the closest he had to offering to assist me in any investigation of Islamic extremism'. Qatada, who lived in Acton, west London, was believed to be prepared to use his influence to "to control the hotheads and ensure terrorism remained off the streets of London and throughout the United Kingdom". The report also records that, during the meetings, Qatada revealed "little love of the methodology and policies pursued by Osama bin Laden". But the commission's ruling suggests that over time Qatada's has hardened. "It is apparent from all the material we have seen that the appellant's attitude to possible attacks in or against the interests of the UK has developed," the ruling said. The commission says that change in view had occurred particularly since the 11 September 2001 attacks although he was "careful" to avoid airing his views in public. "He did, however, reiterate his views that to fight Jews even in the UK was acceptable," the report said. "Although he expressed dislike for bin Laden's approach in early 1997, the material we have seen makes it clear that he has not maintained that view. "Certainly he has assisted and encouraged many who have themselves espoused the al-Qaeda approach and whom he knew or must have known to have been involved in terrorism. "And after 11 September, in a sermon he stated that the attacks were part of a wider battle between Christendom and Islam and a response to America's unjust policies." Qatada, a Jordanian national, also known as Omar Othman, has been held under terror laws since October 2002. He was detained on the orders of the Home Secretary, David Blunkett.